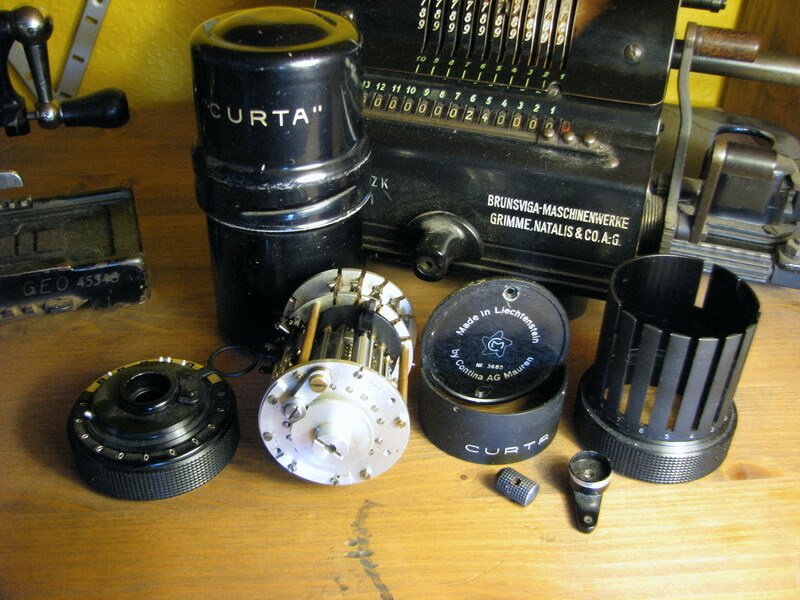 Curtas hold a special place in the heart of every mechanical calculator collector. They are the smallest stepped drum machine in existence, and were made in a plethora of delightful varieties, providing endless collector's joy. I bought N° 2096 on French ebay in early 2003, and drove to Paris on the motorbike to pick it up on a beautiful autumn friday. 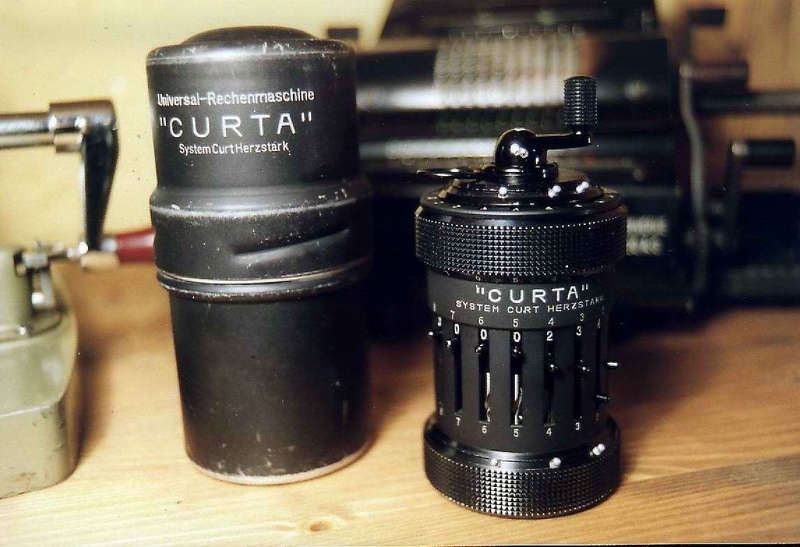 At that point, it was the earliest Curta in Rick Furr's database. I made some beautiful pictures and sold it again to a German collector in order to finance part of the house we bought in 2004, but the longing for early Curtas remained. In 2008, this one showed up. 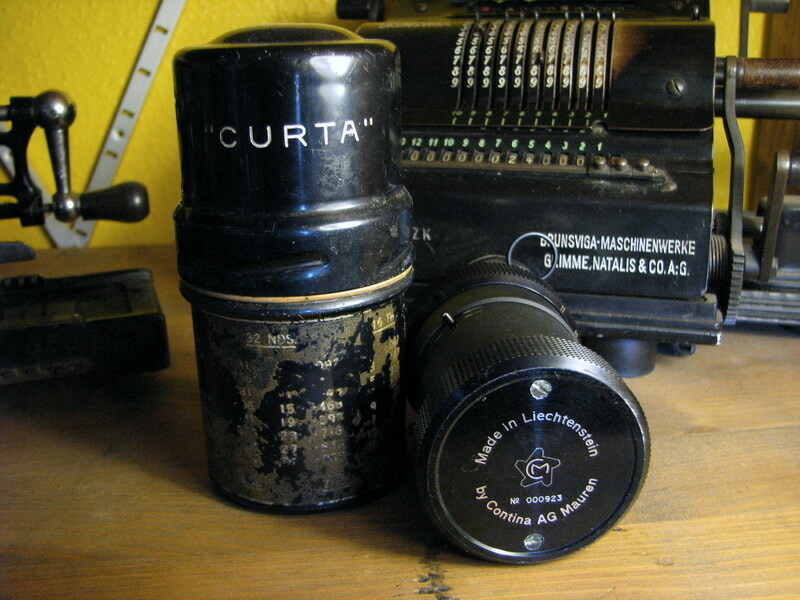 The Curta in question is an early one, as evidenced by the round setting pins. When I bought it however, it clearly had had a few issues during its lifetime, and some repairs to it were quite obvious. The direction switch (the round ones are quite fragile, and commonly crack and break off) and handle had been replaced with a later one . The change of the direction switch also necessitated the change of the complete shrouding of the machine, as the depth of the slots in the early housings is not large enough to permit a later rectangular direction indicator to slide completely downwards (or set a "9" in any of the columns, for that matter). After the repair, a later shroud had to be transplanted to this machine. The carriage was also replaced with a later model. What ever happened to the originals, we'll never find out. 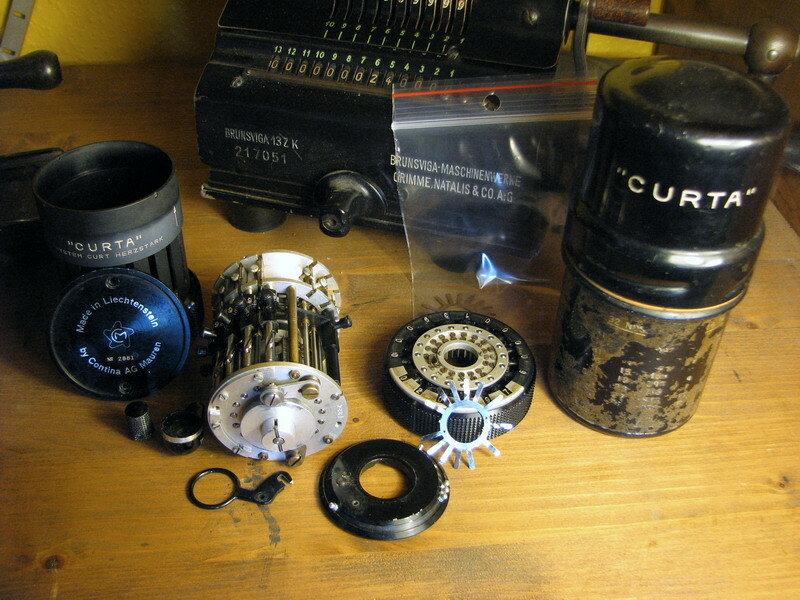 I bought two derelict early Curtas, n°s 2881 and 3685. 3685 had its handle broken off, with damage to the main crank, but had a useable early (but not very early) carriage and top shroud - strictly, also the shroud is not early enough. Somewhere between serial nr. 2096 and 2881 Contina deleted the extra engraved numbers 1-8 on the bottom of the shroud. The top shrouds of n°s 2096 and 3685 are here shown side by side, to highlight the differences. I used the parts from 3685 to restore the early n° 000923 to the above-pictured almost original condition. The later shroud, carriage and direction slider off the repaired 000923 were paired with the damaged nr. 3685. I had hoped that the carriage of 2881 would still be the very early type (there are some very minute detail differences), but this proved not to be the case. In Curta n° 2881, everything was working properly, except for the carriage itself, in which the spider spring turned out to be complete spaghetti, and torn to pieces. I bought a replacement spring, but still have to install it to return this calculator to working condition. Notice how the early spring is silver in colour, whereas the later replacement is brass. If I ever get round to repairing n° 3685, it will be a bitsa machine, with bits and pieces of many different years. Notice how the slots in this later housing are deeper compared to n° 000923. 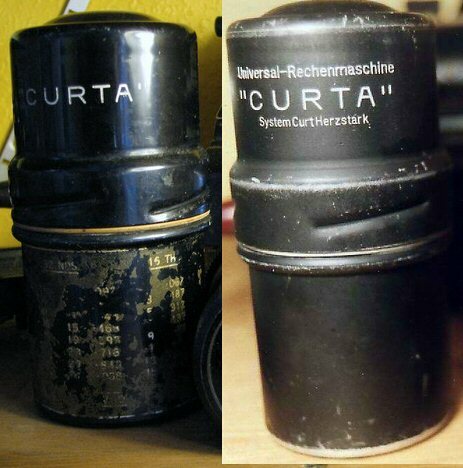 Curta N° 000923 was found on UK ebay, but went pretty much unnoticed due to the later carriage and handle, and the fact that it was advertised as having severe issues as well. Apart from all the appearance issues from the repairs, the ratchet pawl had come undone, so the machine would turn both ways, and in a misguided attempt to unblock it, at some point some gorilla had also snapped the pin that holds the crank to the main shaft. With the parts of N° 3685, this was all easily rectified, and the machine now works fine and closely resembles its original appearance, except for those engravings on the top shroud. N° 000923 did not come with a box, and I am using the one from 2881 for display, but it is also wrong. The very early boxes had different writing, and were matte black instead of glossy. If anyone has a lead on an orphaned one of these very early boxes that is for sale, please contact me! The glossy box that came with 2881 had a dealer sticker on the bottom part of the box for conversion of English units to metric. It has mostly worn off. 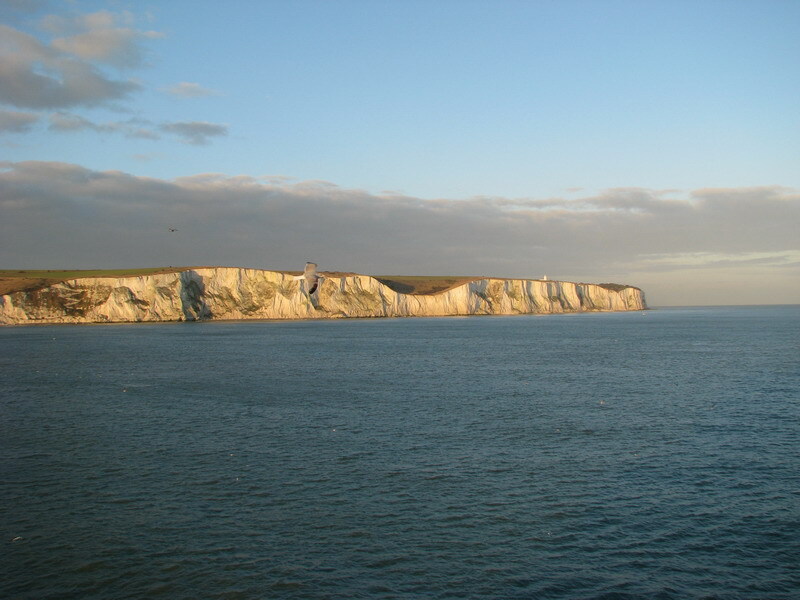 Since shipping from the UK to Belgium is ridiculously expensive, and Karen, who was selling machine N° 000923 for her dad, lived in Dover, I simply hopped on the Calais-Dover ferry as a foot passenger on a beautiful St. Nicolas day, and walked from the ferry port to the address where the calculator resided. 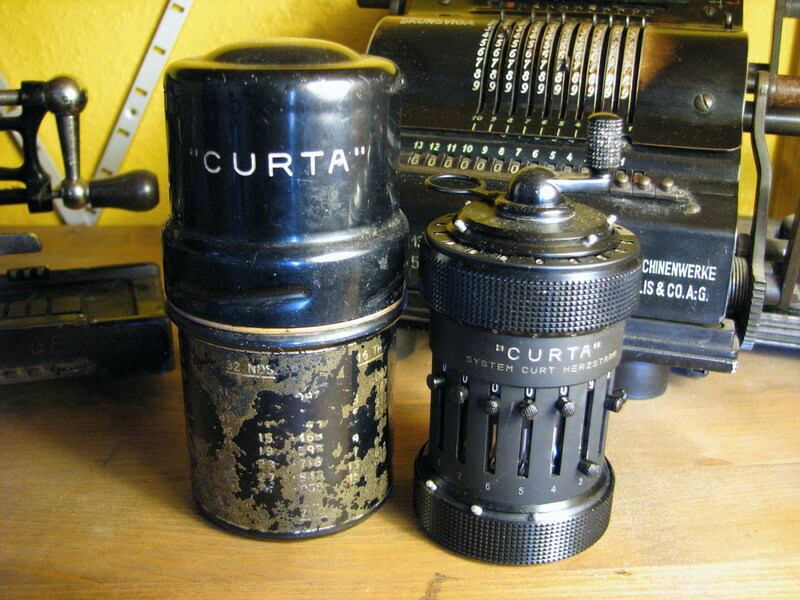 Payment was made, and I walked back happy as a clam with what would be again the earliest known Curta in the database. 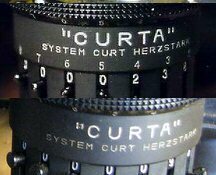 There are of course earlier Curtas known in Germany, down into the two digit serial number range. 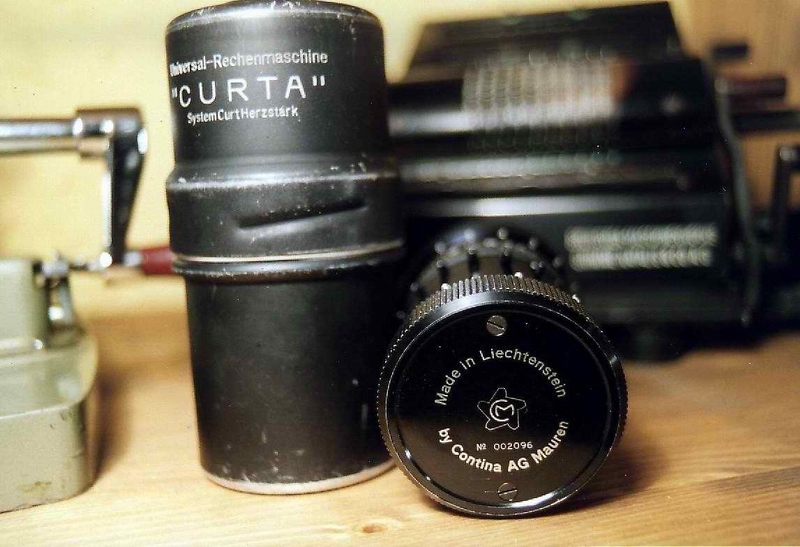 Jan Meyer in fact has a picture of the baseplate of N° 000912 on the curta.de website since 2003 for those who have a good eye, but none of the owners of these very early machines has so far come out of the woodwork and published pictures or details. This should be considered an open invitation to do so!